Airports are relied upon heavily throughout the world to not only fly passengers to their destinations, but by commercial retailers on a daily basis for expedited package delivery services. Airports open on a daily basis 24 hours a day; 7 days a week, but an often overlooked scenario such as a power outage could cause devastating effects. What if an airport were to lose power? 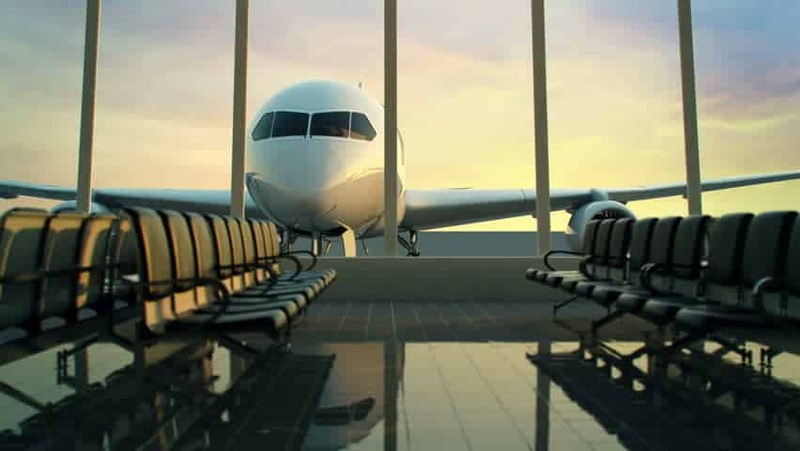 The simple fact that airports are constantly open and operating means one thing – airports heavily rely on a continuous supply of power to stay on track and operating on a regular basis. Without continuous power, airports would face delays and cancellations for passenger flights and cargo. Having a continuous source of power at an airport isn’t just for simply keeping on the lights. Power is needed for airport systems to help track and monitor flight times, arrivals, departure, cameras, security systems, and communications relays that may report vital information such as inclement weather, law enforcement warnings, and government agency dispatch. Airport equipment and internal transportation methods, such as boarding bridges, moving walkways, escalators, and elevators may also cease to function, potentially stranding employees & passengers and also result in possible injuries. Power loss due to power outages can also affect the ambient temperature of the airport, which could be the result of the airports central heating & cooling systems shutting down. If the airport is in a hot location, power loss can bring down the air conditioning, creating sweltering temperatures that can pose a threat to anyone in the building. If the airport is located in a region with cold climate, loss of heating due to power outages can result in extremely cold temperatures, putting all building occupants at risk of hypothermia. Why Would An Airport Lose Power? Power outages occur due to a variety of factors. The main cause of power outages at airports would be inclement weather. Inclement weather can not only ground planes from taking flight, but could also result in power outages that could create potentially unsafe environments for employees & passengers. Natural disasters such as earthquakes, hurricanes, tornadoes, and floods can also result in power loss due to power outages at airports. There is also the U.S. power grid, which is widely known to be failing due to an aging infrastructure that has been resulting in brownouts and blackouts throughout the country. The increase in demand for electrical power has become so great, that many power plants and the power grid is experiencing difficulties in meeting those demands. Additional factors for power outages could be faulty wiring, design engineering flaws, or unlawful external threats. When a commercial real estate property or industrial facility loses power, they usually invest in a form of backup power like a commercial generator. An airport is no different. Installing a backup commercial generator in an airport can be a great safeguard against power outages that can result in devastating profit losses, credibility, and reliability ratings. Commercial generators are not the atypical generators that you can find in hardware stores, but are made to output large volumes of power and runs on either diesel fuel or natural gas. Commercial generators are usually installed to keep key equipment, machinery, and vital systems running, even when the power goes out. Depending on the size and output of the commercial generator, it can even power an entire building and everything in it. More information about commercial generators can be found here: What Is A Commercial Generator? In the case of most airports, one commercial generator would not be enough to keep the facility running in the event of a power outage. Airports would most likely need to install multiple large commercial generators that would be capable of generating over 1 mW (1,000 kW). Installation and use of these generators would ensure that airports could ensure normal, day to day operations without a missing a beat, even during an extended power outage. Although it may seem like a fairly simple process, there are a lot of steps involved in the installation of a commercial generator. Most recently, one of the busiest airports in Atlanta, GA experienced a fire underground that affected their main power supply. This resulted in the airport experiencing a total blackout, leading to grounded flights and a complete shutdown in operations. This airport has since been working on a plan to install 20-21 commercial grade generators to produce around 60-65 mW (60,000 kW – 65,000 kW) to keep their airport 100% fully operational, even in the event of a power outage. Though power loss due to power outages at an airport is often an overlooked item, it may be something to keep in the back of your mind moving forward.